A talking dog bone can help fill the void your pet experiences when you can't be there for him. In today's economy, it often takes two working partners to make ends meet, and as a result more dogs are spending their days alone at home. For some dogs, this doesn't present too much of a problem. They find it easy to simply sleep the time away, with the occasional snack and drink from the water bowl, or by playing with their toys. For other dogs, the experience is more stressful. Pets that feel anxious about being separated from their human companions may engage in less than desirable behaviors when left home alone. Problems can range from mere nuisance barking, to house soiling, to destructive chewing. While the average dog toy or chew bone may keep some of these unhappy pets occupied for a while, these items are useless to dogs that suffer from severe separation anxiety. Dog in this category may need some professional help to overcome their fears, but a bone is something you can still try to help alleviate some of their stress. A talking dog bone is one of the next generations of interactive dog toys. Think of it as picking up where the humble squeaky leaves off. Talking bones are chew toys that contain inner voice modules that activate when your pet begins chewing them. Although the sound of any human voice is likely to be music to a lonely pup's ears, these toys take the comfort zone to the next level by allowing you to record a short message for your pet. Every time your pet picks up the toy, he'll be reassured by the sound of his master's voice. If you want to make the most of a talking bone, you can begin training your dog before you even introduce the toy. First, start using a key comforting phrase when you snuggle your dog, something positive that makes him feel reassured and loved, but is said in a soothing tone that doesn't over-excite him. Next, introduce the talking bone, but deactivate it so the voice mechanism isn't engaged yet. When you offer the toy to your dog, use that key comforting phrase over and over so he associates your voice with the toy and positive feelings. Finally, record that same comforting phrase into the voice module, and offer the toy to your dog again. If he seems a little nervous to hear your voice coming from a different direction, reassure him with your phrase, and pet him until he relaxes. Supervise him with the toy for a while to make sure it doesn't cause the kind of stress you're trying to alleviate. Now that your dog is acclimated to his new bone, you can try offering it to him the next time you leave home. If it does the trick, you should come home to a much calmer pet, still happy to see you, but not standing in the middle of his own pile of destruction. This ball will replay your prerecorded message for your pet, and can be packed with treats that will be dispensed randomly throughout the day. What more can you ask for? See the next toy. This treat ball combines a food reward, the sound of your voice and motion activated laser lights. If you've ever seen the fun a dog has following the red pin-point of a laser pen, you know your dog will have a great time with this toy. For dogs that prefer the security a plush toy offers, the Talk to Me Treat Pup is the answer. A ball compartment in the toy's tummy holds treats your pet has to work out to enjoy. As with all Talk to Me toys, the voice module is activated by motion. How about a little canine-style hip hop for your pet? Beef Street Boys Rapping Dog Toys will likely grab your dog's attention. A pressure activated voice box plays a dog-theme rap tune whenever your pet chews on his new plush toy. Of course, your dog won't understand a word of these tunes, but he may still find the human voice stimulating. These stuffed toy characters are loosely based on some of today's rap stars, including "Master Pee" and "Run D.O.G." If your dog isn't the toy playing type, you can still offer the reassurance of your voice with one of these motion-activated ID tags. 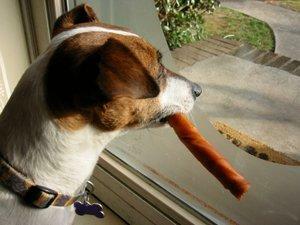 Giving your pet a talking dog bone or toy can be a great way to amuse him when you need to leave him home alone. While anxious dogs may find these toys especially beneficial, almost any dog will enjoy a kind word spoken in their favorite person's voice. If it makes you feel a little easier about leaving your pet behind for the day, so much the better.